Updated 10/08/18: This roadmap shouldn’t be used as a guide anymore as it no longer reflects the current state of development. The team ended up doing things in reverse. It was decided that some things in the beginning of the roadmap needed more research, so instead we started with the rebase to a modern codebase which was mentioned in our most recent update. Original Post: Below is the full roadmap from the Peercoin Team for 2018-2020. In Peercoin, the timestamp is important because it is linked to the fundamental Proof-of-Stake (PoS) concept of coindays. In order to know how many days a particular output has accumulated, the protocol currently refers to the timestamp of the transaction. However this extra bit of information in the transaction makes Peercoin incompatible with many tools existing in the Bitcoin ecosystem. Removal of this field as proposed by RFC0004 will make Peercoin compatible with an enourmous amount of software and tools made for Bitcoin. Multisignature minting will allow for participation in the minting process from coins that are offline in cold storage. A provably secure minting option like this is expected to greatly increase participation from minters, thereby improving confidence in chain security. Peercoin’s economic model revolves around destroying peercoin as a fee on each transaction rather than paying the fee to miners. Thanks to this feature, size of the transaction is self-regulating and artificial limits on OP_RETURN are redundant. Removing this limit will make Peercoin more appealing to decentralized application developers. P2SH scripts are smart contracts and allow for constructs like multisignature addresses, however in Bitcoin they have a size limit which makes them less useful. Thanks to the self-regulating nature of Peercoin transaction sizes we can accomodate for more complex P2SH scripts. Removing this limit will make Peercoin more appealing to decentralized application developers. Allowing usage of zero-value outputs without the usual downsides (UTXO table pollution). This will make Peercoin more appealing to decentralized application developers. multisig minting UI integration and tooling. Integration of multisignature minting in the official client. Payment channels are the future of payments and we are looking forward to seeing the technology mature. Peercoin’s economic model allows easy on chain scaling. To tackle future increases of blockchain usage we will allow for dynamic block size increases. 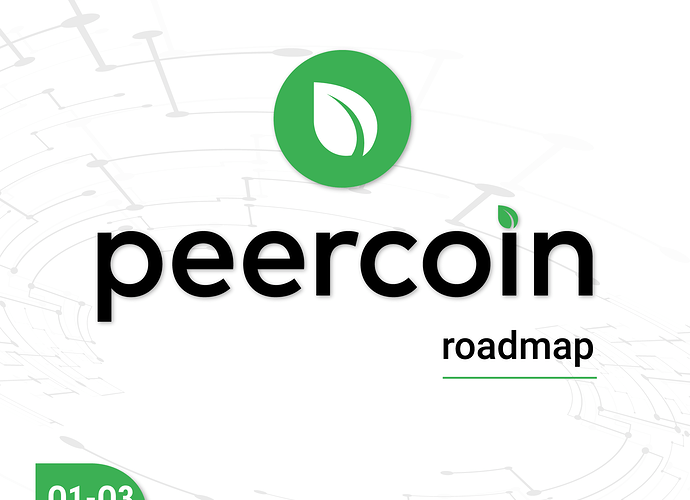 Peercoin ROADMAP -- Want to see it? On the road map, it says timestamps, which measure coin-days, will be removed. How then will Peercoin be able to know a coin has been stored in a client 30 days to start minting, and 90 days to achieve maximum minting potential. Thanks. Peercoin's transaction timestamp is not strictly needed by the protocol and can be abitrarily chosen by the transactor with very little restrictions. The timestamp provides a small but unfair advantage to educated users and breaks compatibility with Bitcoin infrastructure. Removing the transaction timestamp facilitates broader adoption of the Peercoin blockchain by increasing the amount of compatible tools and enables the development of protocol improvements like [multisignature minting](../0003-multisig-minting/0003-multisig-minting.md). - The key words "MUST", "MUST NOT", "REQUIRED", "SHALL", "SHALL NOT", "SHOULD", "SHOULD NOT", "RECOMMENDED", "MAY", and "OPTIONAL" in this document are to be interpreted as described in [RFC 2119](http://tools.ietf.org/html/rfc2119). Thank you for the above links, very interesting. In a nutshell, instead of measuring coindays by specific transaction timestamps, peercoin will use generalised blockchain timestamps, thereby increasing compatibility with bitcoin, as well as removing a small unfairness. Though PA is blockchain agnostic, launching on the Peercoin (PPC) blockchain carries with it many benefits. These advantages include a static fee of 0.01 PPC/KB, a blockchain smaller than 0.5 GB, responsive governance where burnt fees means minters are concerned with ppc use cases, and superior decentralization and security with minters located all over the world. Can someone explain what is meant by “minters are concerned with ppc use cases”? In Bitcoin, miners are attempting to maximize the quantity of fees they get. This basic principle is one way of viewing the Bitcoin Cash hardfork, that the two groups disagree about what behavior will generate the most fees for the miners right then. It is a very short-sighted viewpoint, balancing protocol with personal profit. Peercoin, on the other hand, burns the fees so the entire network profits instead of just the minter. In this kind of atmosphere, a minter is concerned with promoting use cases for Peercoin that will result in more overall transactions. This avoids the dilemma of how to adjust protocol to maximize the fee reward and shifts it to how to increase the number of users and the frequency at which they use the chain. For example, if someone found a way for miners to get 3x the fee profits today, but it would destroy bitcoin in 5 years, game theory says that all the miners would take the short term profits. Peercoin, on the other hand, would aim for the reduced profits today because all the minters are hodlers only concerned with reducing supply over the long term, not the short term. In this kind of atmosphere, a minter is concerned with promoting use cases for Peercoin that will result in more overall transactions. This avoids the dilemma of how to adjust protocol to maximize the fee reward and shifts it to how to increase the number of users and the frequency at which they use the chain. The 1% burnt transaction fee and on 1% average minting reward can also be appreciated. It’s not equilibrium and that is where the inflation control is observed. Though what is Peercoin meant to be? Is it a cryptocurrency savings account? Users store their coins and earn interest? Potentially with few transactions. Or is it meant as a way to securely transfer and manage coins/assets? Then applications run outside the blockchain and interact and manage their coins/assets via the blockchain api? Popular applications would encourage frequent transactions. Minters and people actively transacting on the chain are essentially two different components of the ecosystem, because to transact with the coins is to burn coindays. So it is meant to do both things. However, it is important to realize that going from minter to active transactor and vice versa is a zero-cost process (ignoring the time aspect of it). The section we are discussing from the article was pointing out that in bitcoin neither group participates in governance, instead bitcoin governance is essentially third party, causing a misalignment between those that own coins and those that govern. Switching from an active transactor to governance and vice versa in bitcoin is a very lossy process, as you must sell your coins to buy a mining rig or vice versa. First, Sunny King himself referred to savings accounts; and second, bitcoin was referred to as a currency for “spending”, so Peercoin, looking for an alternative role, was regarded as for “saving”. However, savings vs spending is a red herring, in that both functions represent uses of currency. Neither bitcoin nor peercoin are suitable as a currency (in my view) due to the volatility. Whether one is spending or saving, it is no good if your units of exchange are rising and falling by large percentages every every day! Sunny’s full quote: “I think the cryptocurrency movement needs at least one ‘backbone’ currency, or more, that maintains high degree of decentralization, maintains high level of security, but not necessarily providing high volume of transactions. Thinking of savings accounts and gold coins, you don’t transact them at high velocity but they form the backbone of the monetary systems”. Gold coins and savings account are scarce (fiat money less so). However, scarcity alone does not give an asset value (both Picasso’s and my son’s paintings are scarce). Gold has no intrinsic value – it’s a metal w/ limited industrial/commercial application. But, Gold has historic value (i.e., millennia of public confidence that it will maintain its purchasing value). This historic value gives it demand. Either intrinsic value or historic value will yield a store of value, and therefore demand. Peercoins (and Bitcoins, Ether, etc., etc.,) seem both scarce and non-scarce. Yes, they’re scarce in that I cannot create more Peercoins from thin air, but I can download the code and launch my own clone coin at any time (“Clone Coin”). POS coins seem to have a disadvantage as to scarcity as to POW coins. POW coins have real world, hard resources going into mining – it’s literally amazing the amount of electricity going into BTC mining right now. I can create a POS Clone Coin and a novel manner of distribution and POS nodes w/ very little resources, but I cannot easily create a POW Clone Coin with anywhere near the level of resource consumption as BTC. This does create a question whether POW coin with more resource consumption is more or less scarce than a POW coin with less consumption. Notwithstanding centralization and collusion problems, the security of __________ megawatts going into BTC mining is not easily replicated and does make BTC seem rather scarce. SK’s decision to make a hybrid POW/POS coin is truly brilliant. As to demand, historic value is out – we’re all speculators (speculative value is fleeting). So, intrinsic value is all we have left. An asset has intrinsic value if it produces returns (e.g., a share of Walmart stock has intrinsic value because it produces dividends). Cryptocurrencies in and of themselves do not produce returns. However, cryptocurrencies tied to blockchain services do produce returns in the form of a consumable tokens or fees paid to the coin holders. Ethereum has Ether required to transact on the Ethereum blockchain. PeerAssets will have Peercoin – the Peercoin protocol requires 0.01 PPC / kb burnt, which will benefit all Peercoin holders. I don’t know what BTC has in terms of blockchain services, but BTC in an of itself has no intrinsic value. In conclusion, the demand for blockchain services will determine the value of cryptocurrencies. Therefore, it’s a competition between blockchain service providers where we compete in terms of security, stability, portability, costs, ease, etc. PoW efficiency today is much higher than iswas 8 years ago. You can mine all the same work now for a fraction of the resources that were spent then. Sunk resources implying real world value is a farce. Will the new V0.7 version of the wallet be released as scheduled? This roadmap shouldn’t be used as a guide anymore as it no longer reflects the current state of development. The team ended up doing things in reverse. It was decided that some things in the beginning of the roadmap needed more research, so instead we started with the rebase to a modern codebase which was mentioned in our most recent update. Edit: I updated the original post to add in the above message.